A living testimony of a man, who have been swallowed by a hippopotamus and survived spending 3 minutes inside hippo’s mouth 17 years ago, though the incident have given him serious injuries, according to report by The Examiner site. Paul Templer, 44-years-old, the man behind the hippo’s mouth and he tells the story about his experience of having been swallowed by a hippo. Templer said, "We were near the end of the tour, the light was softening and we were taking in the tranquillity. The solid whack I felt behind me took me by surprise." He added, "The hippo who tried to kill me wasn't a stranger – he and I had met before a number of times. I was 27 and owned a business taking clients down the Zambezi river near Victoria Falls. I'd been working this stretch of river for years, and the grouchy old two-ton bull had carried out the occasional half-hearted attack. I'd learned to avoid him. Hippos are territorial and I knew where he was most likely to be at any given time." At that moment, he was together with his 3 apprentice guides – Mike, Ben, and Evans – all in kayaks at Zambezi river. And fortunately, Paul was given helped by his apprentice and managed to stop the bleeding and took him quickly to a medical team. Paul Templer got 40 puncture wounds and a crushed arm that eventually had to be amputated, and an exposed lung. For the meantime, if you like the information about Manny Pacquiao vs Brandon Rios fight, please bookmark this page and share it to your friends on Facebook, Twitter and Google+. 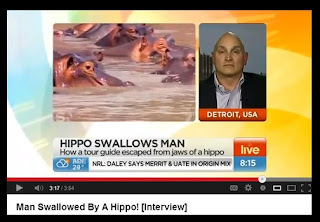 Comments or suggestions about "Man swallowed by hippo survived" is important to us, you may share it by using the comment box below.